Biodex continues to move the isokinetic dynamometer application forward. Biodex Medical Systems, Inc., a provider of innovative medical devices, announces the availability of Upper Extremity Hemiparetic Attachments for its Multi-Joint System computerized robotic dynamometer. According to the Centers for Disease Control and Prevention, strokes are a leading cause of long-term disability in the U.S. One of the main treatment protocols for stroke survivors is acute physical therapy. The new Upper Extremity Hemiparetic Attachments from Biodex are uniquely made for the rehabilitation of post-stroke patients left with upper-extremity hemiparesis. While upper-extremity weakness is a common result of strokes, current methods of stroke rehabilitation therapy often overlook it, resulting in compromised post-stroke motor function. Most common hand- and upper-extremity rehabilitation practices include approaches that don’t adequately address the progression of strengthening exercises that are needed to improve function. 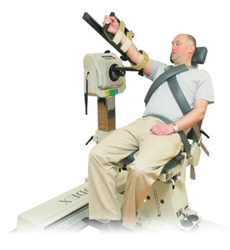 In contrast, the use of the Biodex dynamometer ensures that the patient’s trunk stays stabilized, while the Upper Extremity Hemiparetic Attachments help organize neuro-motor output through specific joint patterns for the shoulder, elbow and wrist. The lightweight, carbon fiber Upper Extremity Hemiparetic Attachments are available as a set, including attachments for shoulder patterns as well as wrist and elbow patterns. There is also an integrated ROM stop and lock knob, which allows for the same attachments to be used for either the left or right side, without having to remove them from the dynamometer head. The attachments are designed to accommodate the weakened grasp associated with stroke hemiplegia. The Biodex Upper Extremity Hemiparetic Attachments are compatible with the Multi-Joint System 3 and System 4, Pro, MVP and Quick-Set models. To inquire about any model of Biodex System 4 or the new attachments, please contact Biodex at 800-224-6339 or by email at info(at)biodex(dot)com. Biodex Medical Systems, Inc. manufactures and distributes medical devices for physical medicine, nuclear medicine, and molecular and medical imaging. It also provides balance assessment for concussion management as well as fall risk screening and conditioning programs. The Biodex commitment to innovative excellence spans more than 60 years. Our customer-driven support is why leading medical facilities around the globe call Biodex first.